Sometimes the best laid plans go awry and that’s never a fun thing when dinner guests are on the way. I had a big ole pork roast in the fridge and the Kitchen Genius suggested we invite my Mom and my step-father Tom over for dinner because Tom loves a nice pork roast. Good call - until I opened the package of meat a little after 4 p.m. and a bad smell wafted up. Uh oh! In a panic, I called KG, because he’s the first person I call for pretty much every disaster or triumph - no matter how minor. Lucky him, huh? We needed a new dinner plan and my mind went blank. KG was working and distracted, so he wasn’t much help. Even though Mom and Tom would have happily eaten scrambled eggs, that menu wasn’t going to make ME happy. I grabbed a pile of magazines and leafed through them to find a recipe that wouldn’t require a major shopping trip. The issue I received was full of yumminess that I can't wait to try like fresh pasta made into gorgeous dishes like Classic Cannelloni, and Pappardelle with Three Mushroom Ragu, but those would have to wait for another day when I had more time. Luckily, the magazine also had a recipe for a fast and elegant dinner called Chicken Pomodoro. A quick peek in the pantry and fridge confirmed I had all the ingredients except boneless chicken breast, so (a once again helpful) KG picked some up on the way home. I had a package of Codino’s Stuffed Rigatoni filled with spinach and ricotta in the freezer, so that became an easy side dish. I love the unusual shape of these little babies. They’re like tiny pillows with a ruffled edge. Simply delightful! Add a tossed salad and I had dinner on the table in about 45 minutes. Place chicken breasts between two pieces of plastic wrap and pound to an even thickness. Season breasts with salt and pepper and dust each side with flour. Heat olive oil in large skillet over medium high heat. Brown chicken in two batches (don’t overcrowd pan) about four minutes on each side. Remove browned chicken and set aside. Take skillet off the burner and allow to cool slightly. (If you have a gas stove, turn off the flame.) Add vodka to pan and whisk to deglaze bottom of skillet. Return pan to burner and lower heat to medium low. Cook vodka until it is nearly gone. Add chicken broth and lemon juice. 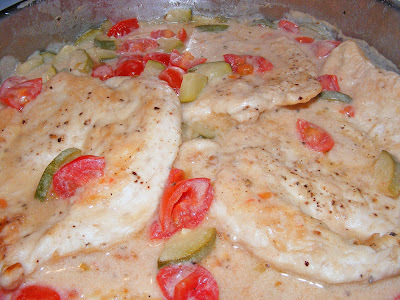 When the sauce is heated, add browned chicken, zucchini and tomatoes. Simmer for about ten minutes, until chicken and zucchini are done to your taste. Remove chicken and place on a platter. 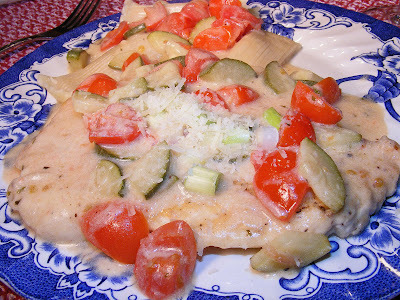 Scoop out tomatoes and zucchini with a slotted spoon and spread on top of chicken breasts. Add cream to skillet and whisk to blend. Pour sauce over chicken. Serve with your favorite pasta. Top with fresh grated Romano cheese. That sounds delish. I've made that classic canneloni and it's wonderful. I don't think I've had a dinner plan fall through so I am no help! Good save! This looks so creamy and delicious. I usually turn to pasta when I need dinner in hurry. And frozen shrimp! They thaw out so quick. Ugh that sinking feeling when you realise your dinner plans are not going to work out!! I sympathise completely. Chicken cacciatore is pretty good when plans go awry. It's really easy and tastes very good indeed. All you need is chicken, tinned tomatoes, mascarpone cheese, an onion, garlic, and some fresh basil. You could cook it blindfolded, it's that simple. That looks really good! WHat a shame about the pork. I have been known to take that sort of thing back to the supermarket and let the smell of it get me a refund. Ohhh this sounds sooo nice! I'll bet my honey would love it! Yum! Sometimes I think those last minute (on the fly) meals turn out to be the best! This looks delicious. Kudos to you for the fantastic save!